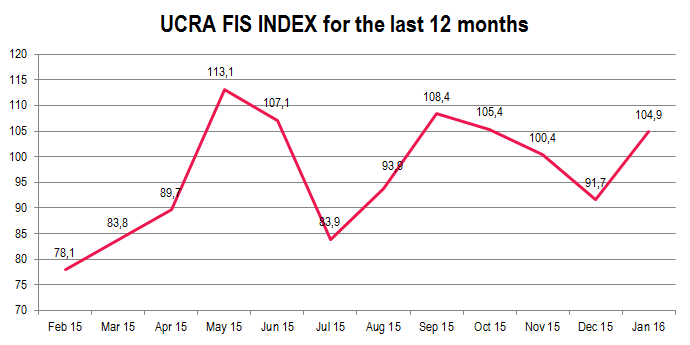 UCRA FIS INDEX (Foreign Investor Sentiment Index) for Ukraine returned to positive territory for the new year at 104.9 points. Investor sentiment has been greatly influenced by the adoption of the state budget for 2016 and changes to the Tax Code at the end of December. According to respondents, it gives investors a greater level of certainty on the prospects of further cooperation of the IMF with Ukraine. The negative factor for investors is potential political instability manifested in public scandals in the upper levels of the state authorities. At the sectoral side, as before, the prospects of investment in IT (sub index value of 145.5) and agriculture (135.5) are the most optimistic among respondents. The attractiveness of investments in the sector of trade and services as well as industrial investments is perceived at an equally low level (85.7). In terms of instruments, as well as earlier, investors prefer bonds (124.9) to equity investments (81.9), however, the attractiveness of portfolio investments for the past month has increased significantly (by 26.1 points for shares and 21.9 points for bonds). 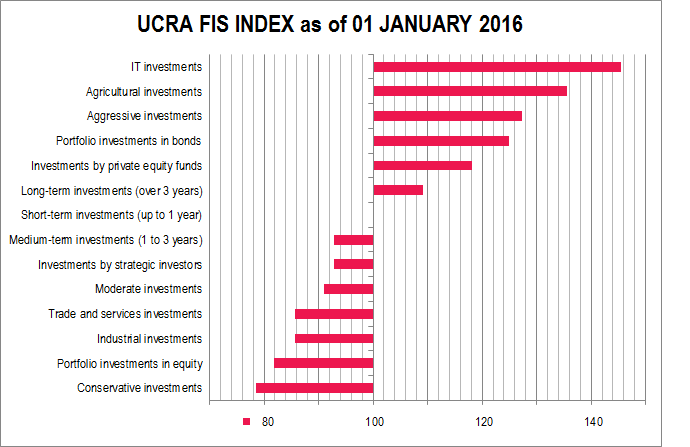 While perception of direct strategic investments improved slightly, although it remained in negative zone (an increase from 72.7 to 92.9 points), investments by private equity funds are becoming to be much more promising, according to respondents, as this component of UCRA FIS INDEX sharply rose from 84.0 to 118.2 points. This change in sentiment to a certain extent can be attributed to the decision of George Soros to invest in the new Ukrainian private equity fund managed by Dragon Capital. Prospects for long-term investments (109.9) are viewed by our respondents better than the prospects for short-term and medium-term investments (100.0 and 92.9 respectively). Aggressive investment strategy (127.3), as has been the case throughout the observation period, takes over moderate (90.9) and conservative (78.6) approaches to financing projects in Ukraine.